Carina Lau joined actor Wei Daxun for the Harper’s Bazaar 150th anniversary exhibition in Shanghai, China on Thursday (December 21). 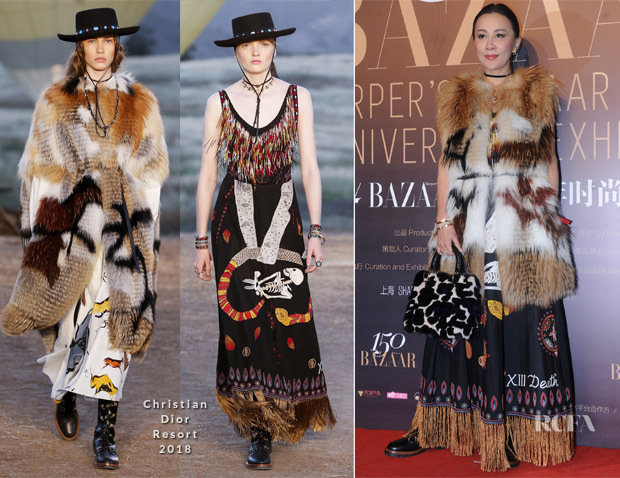 The Asian actress has never been one to play it safe, which is why I’m not at all surprised by her going full steam ahead with this rodeo-style Christian Dior Resort 2018 look. Most would’ve stripped this way back and opted for one stand out piece, but Carina, being Carina opted for three. I can’t say I’m a huge fan of the fringed bodice, so I’m appreciating the vest within this look. Would I have preferred a plain black bag here? Yes, but I’m not at all mad with how Carina styled this look; without fear. Who Wore Ports 1961 Better? Chadwick Boseman or Wei Daxun?